This book examines the role of messianism in Zionist ideology, from the birth of the Zionist movement through to the present. Is shows how messianism is not just a religious or philosophical term but a very tangible political practice and theology which has shaped Israeli identity. 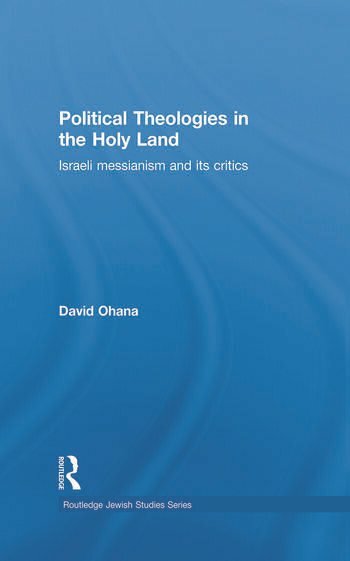 As the first book to examine the messianism in Israeli debate since the creation of the Israeli state, it will be particularly relevant for students and scholars of Political Science, modern intellectual history, Israel studies, Judaism and messianism. David Ohana is Professor of Modern European History at the Ben-Gurion University of the Negev, Israel. He was a visiting fellow at the Centre for European Studies at Harvard University and the first academic director of the Forum for Mediterranean Cultures at the Van Leer Jerusalem Institute. His books include The Promethean Passion, The Rage of the Intellectuals and the trilogy The Nihilist Order.